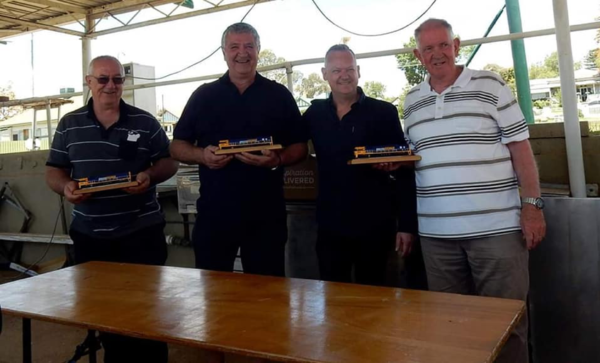 Pacific National Junee recently said goodbye to three Depot stalwarts as Bevan Hackett, Marc Canino and Geoff Crossman decided to call it a day after almost 150 years between them. Colleagues, past and present, gathered from around the state to see the trio off with a day of barefoot bowls. Drinks were had, stories told and laughs shared as attendees reflected on railway life. Former Junee Driver and Locomotive Division Secretary, Bob Hayden, made the trip from Sydney to play a few ends of bowls and say farewell to the retirees. The Locomotive Division will return to Junee early next year and looks forward to catching up with the locals again when the Junee Locomotive Division Depot Social Club has their Farewell.